As a Brain, you would love to shut yourself away in your Ivory Tower, contemplate eternal truths, and let your loyal Toadies attend to your mundane, corporeal needs. If only it weren't for the incessant nattering of the hoi polloi, a bunch of Numskulls, Yahoos, Clodhoppers, Fuddy-Duddies, and Ninnies. Unable to fathom the true joys of reflection and contemplation, they just flitter about, interrupting your cerebral reveries with silly inanities. You find it hard to believe you could even be the same species. They are surely relatives of monkeys, and you are just as surely the handiwork of a higher power. But they're not the worst of the lot. They may never comprehend the life of the mind, but they have some faint idea that you are their superior. The worst of the lot is that pretentious, condescending know-it-all who thinks he is better than you. What an utter fool! Even your Toadies, as simple as they are, have the wisdom to recognize their own ignorance and place unwavering faith in your brilliance, but this vainglorious know-it-all lacks even that much wisdom. He even has the audacity to call himself a Brain. If it weren't for these pests, you could live a life of unadulterated intellectual bliss. But what can you do about them? Being the true genius that you are, you have a brilliant plan to kill two birds with one stone. You will unite the hoi polloi around the cause of taking down your enemy, that infuriating quasi-intellectual poser. With their simple minds, they are easily led, and this war effort will keep them too busy to bother you. You laugh at how you will have the impostor Brain bested by mere simpletons, the very hoi polloi who are intellectual mites compared to you. Knowing his comeuppance is at hand, you serenely retire to your Ivory Tower. 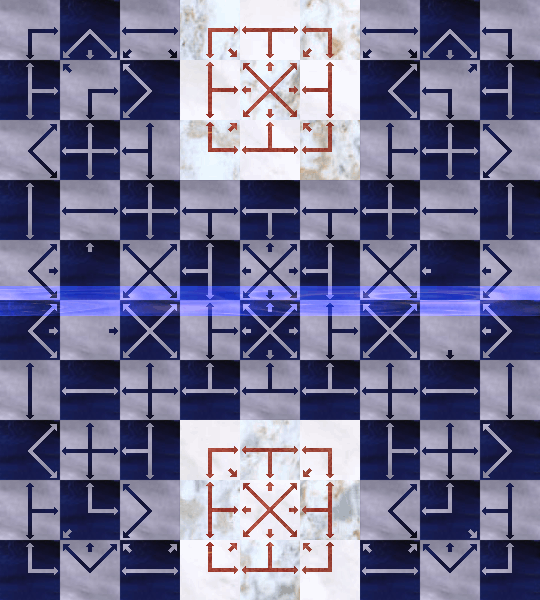 Storm the Ivory Tower is a synthesis of Smess, also known as Take the Brain, and Xiáng Qí, also known as Chinese Chess. The name is modeled after Take the Brain, the name Smess was known by in Britain. The Ivory Tower is the sanctuary of the Brain, analogous to the palace in Xiáng Qí. 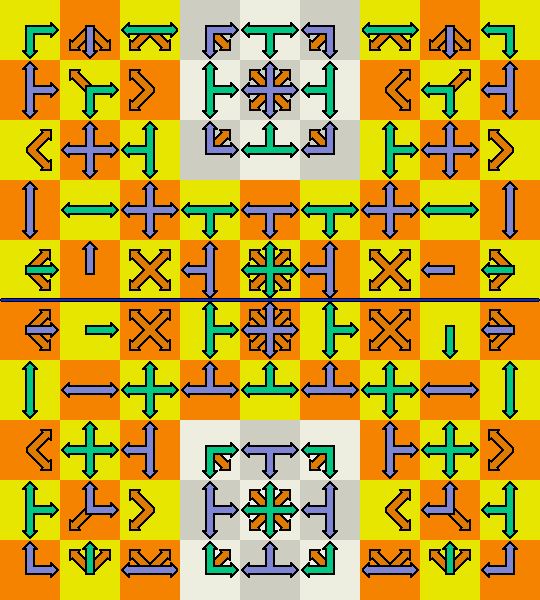 As in Smess, every space has arrows, and these arrows determine which directions any piece may move. No piece is distinguished by its directions of movement. But unlike Smess, pieces aren't limited to riders and one-step leapers. This game includes counterparts for every piece in Xiáng Qí. This is possible, because the pieces of Xiáng Qí are distinguished by more than which directions they move. The original Smess pieces -- Brain, Numskull, and Ninny -- correspond to the General, Chariot, and Pawn. The new pieces -- Toady, Yahoo, Fuddy-Duddy, and Clodhopper -- correspond to the Councellor, Horse, Minister (or Elephant), and Cannon. Brains and Toadies occupy the Ivory Tower, a nine space area on each side with arrows configured to keep the Brain and Toadies inside. This board is based on the same idea as the Smess board, but it is not closely modeled after it. 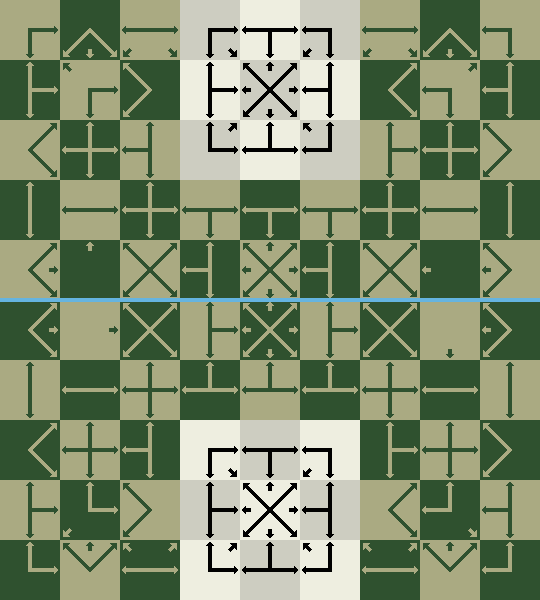 Each side has an Ivory Tower, colored in different shades of ivory on the Smess style board, which fills the same role as the palace in Chinese Chess. The arrows in each tower are configured to keep the Brain and his Toadies from leaving, and the other arrows are configured to prevent Ninnies from entering with their one-step move. All longer range pieces may freely enter and exit Ivory Towers, though a Fuddy-Duddy will be trapped if it enters its own Ivory Tower by a corner. 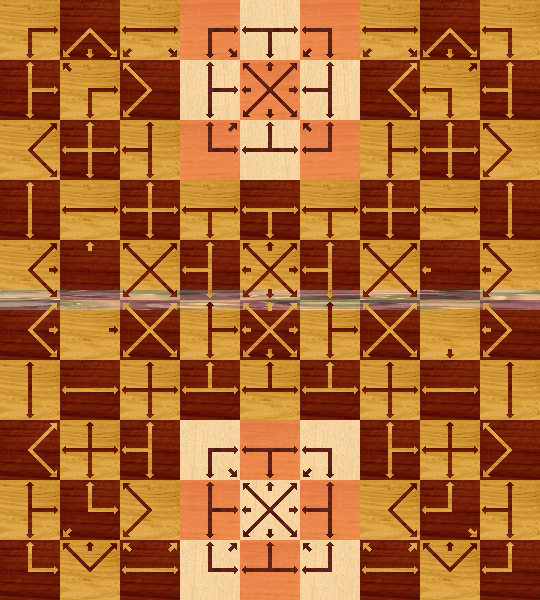 Some arrows are configured to give pieces similar moves to their Chinese Chess counterparts at the beginning of the game. 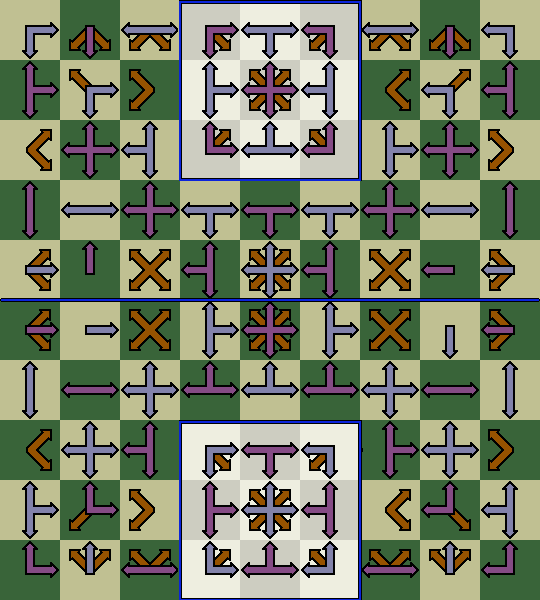 On the Smess style board, orthogonal arrows are violet or green, diagonal arrows are brown, and a blue river divides the board between the fifth and sixth ranks. 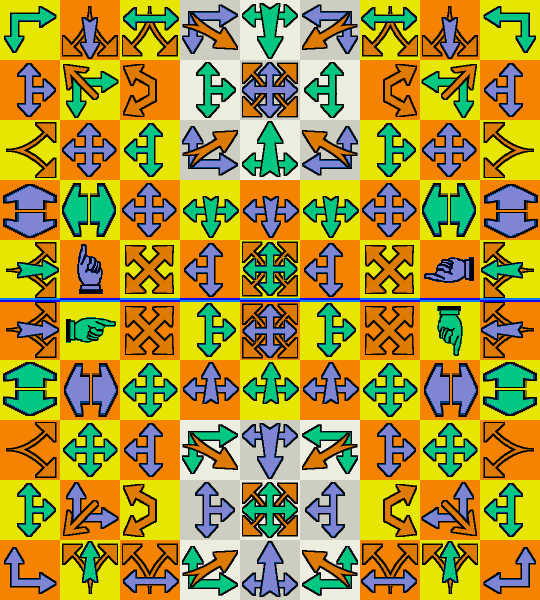 An empty board is shown here, so that you can see all the arrows without pieces obscuring any. 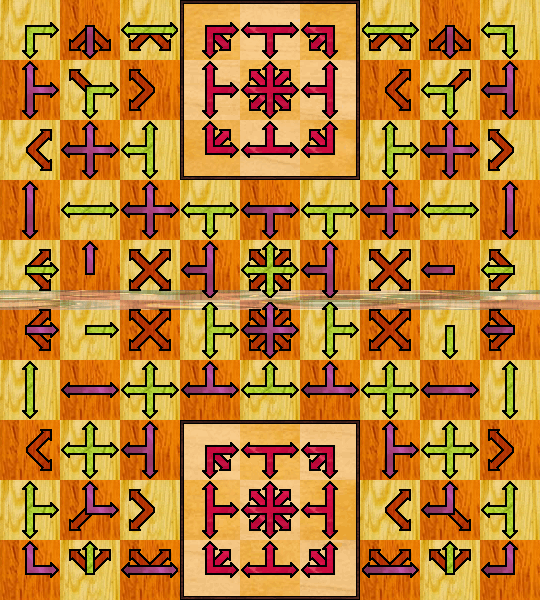 The board is shown here in two different styles. One is based directly on Smess, and the other uses a more uniform arrow design suitable for circular Chinese Chess pieces. The setup is based on Chinese Chess. 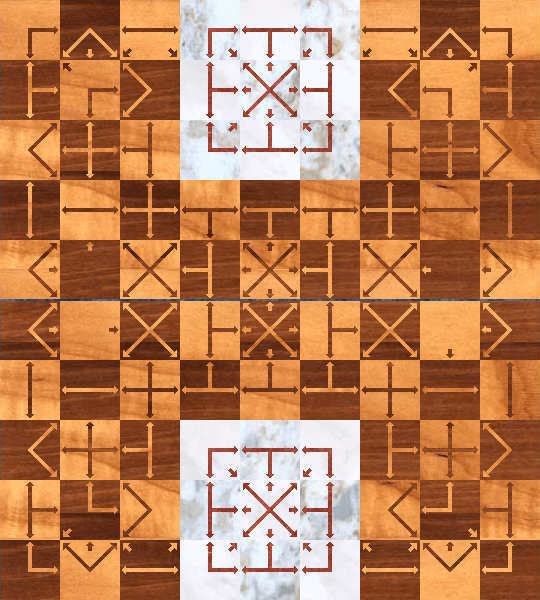 Each piece starts in the same position as its counterpart from Chinese Chess. The piece colors of red and blue are common to both Smess and Chinese Chess. No ASCII diagram is included, because it won't mean much if you can't see the arrows, which are most easily shown in a graphic image. 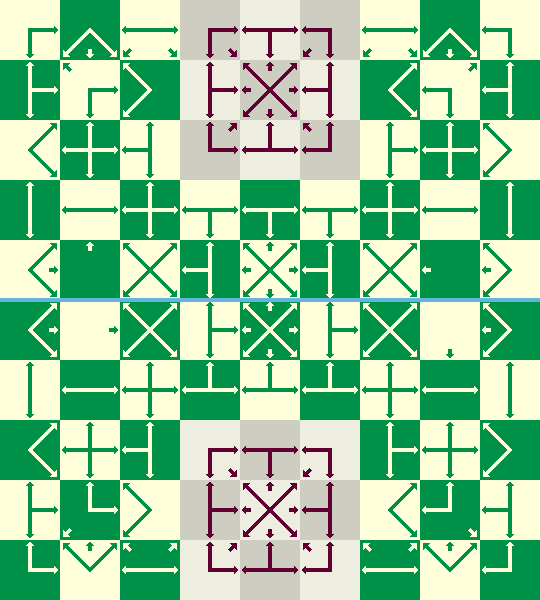 Every piece in this game is the analogue of a Chinese Chess piece. The main difference is that these pieces are not distinguished by which directions they can move. They are distinguished only by the other characteristics that distinguish the pieces in Chinese Chess. Brains, Ninnies, and Numskulls come from Smess, though Ninnies and Brains were modified for this game. The other pieces were newly invented for this game. The Brain is the royal piece in this game. You lose if it's checkmated or stalemated. As a man of thought rather than action, the Brain normally moves slowly, only one space at a time, and stays within his Ivory Tower. The Brain normally moves one space in any direction indicated by the arrows on the square it moves from. Due to the configuration of arrows in the Ivory Tower, it may never leave. But it does have an additional power beyond what the Brain has in Smess. It may move like a Numskull to capture the enemy Brain. Since Brains are never captured, this works much like the rule against opposing Generals in Chinese Chess. The difference is that the Brain cannot attack the other Brain from the third rank, for none of the spaces in the Ivory Tower's third rank point toward the other Ivory Tower. This allows one Brain to actually check the other Brain on occasion. The Toady is the counterpart of the Councellor in Chinese Chess. In true toadying fashion, it stays close beside the Brain, never moving any faster, because he doesn't wish to make the Brain look bad. Like the Brain, the Toady moves one space in any direction given by an arrow on the square it moves from, and the arrows in the Ivory Tower keep it from leaving. The Yahoo is the counterpart to the Horse. It makes a two-step move like either a Mao or a Moa, except that the first step of its move must be in one of the directions indicated on the square it moves from. It may not stop on the first square, which is called the pass square. It must turn in an outward direction and move one more space. It may not move two spaces in the same direction, and it may not move to an adjacent space. When it begins with an orthogonal move, it must finish with an outward diagonal move. When it begins with a diagonal move, it must finish with an outward orthogonal move. The Yahoo may not leap over pieces. When a potential pass square is occupied, the Yahoo is blocked from passing through it. The name comes from Gulliver's Travels by Jonathan Swift, in which Gulliver comes upon an island of intelligent horses who use stupid, uncivilized humans as beasts of burden. The horses call these people yahoos. This makes Yahoo a fitting name for the piece that replaces the Horse. The Numskull is the counterpart to the Chariot. It slides any number of spaces along any rank, file, or diagonal the arrows on its square point. It never changes direction on its move. Only the arrows on the square it begins its move on affect the direction of its move. It moves across any number of empty spaces until it stops on an empty space, captures an enemy piece, or is blocked by a friendly piece or the edge of the board. It may never jump over another piece. The piece and its name both come from Smess. The Clodhopper is based on the Cannon from Chinese Chess. It moves like a Numskull, except that it may capture a piece only by hopping over an intervening piece. I came across the name Clodhopper while searching for synonyms for Boor, because I thought a piece that captured by hopping over others seemed a bit boorish. Clodhopper seemed to be an especially fitting name, because this sort of piece is technically known as a hopper. In this sense, Clodhopper was fitting in two ways. You may think of the piece as one that hops over clods, for most of the pieces in this game are clods of some sort. You may also think of it as a clod who hops. The word literally refers to a kind of big, heavy shoe. By analogy, it refers to some kind of uncultured lout. The Fuddy-Duddy is based on the Minister or Elephant from Chinese Chess. The Fuddy-Duddy cares about doing things just right and abhores spontaneity. So it normally steps precisely two spaces, not any more or less, in any direction the arrows on its square point. It steps one space, then one more space in the same direction. If the first space it moves to is not empty, it may not move to the second space. When it is across the river, it sometimes puts caution before doing things just right, and allows itself to move only one space, but only to an empty space, and never in any direction not given by an arrow. Naturally, the Fuddy-Duddy would never recross the river with such a breach of decorum. The additional power of movement it gains across the river is not a permanent promotion. When a Fuddy-Duddy crosses back to its own side of the river, it ceases to have this power, and it regains it whenever it crosses back to the far side. The term Fuddy-Duddy describes a dull, conservative, unimaginative person. This meaning ties it to ministers (of both the political and religious varieties) more than it does to elephants. The term is reputably a pronunciation of the letters Ph.D., D.D., two degrees that ministers (of the religious variety) have sometimes held together. The Ninny is a simple, peace-loving fellow who wanders about slowly, one space at a time. Not having much drive of his own, the Ninny normally lets the arrows on every square he passes guide his movement. But when the Ninny is across the river in enemy territory, he can work up enough drive to charge up to two spaces toward an enemy piece. 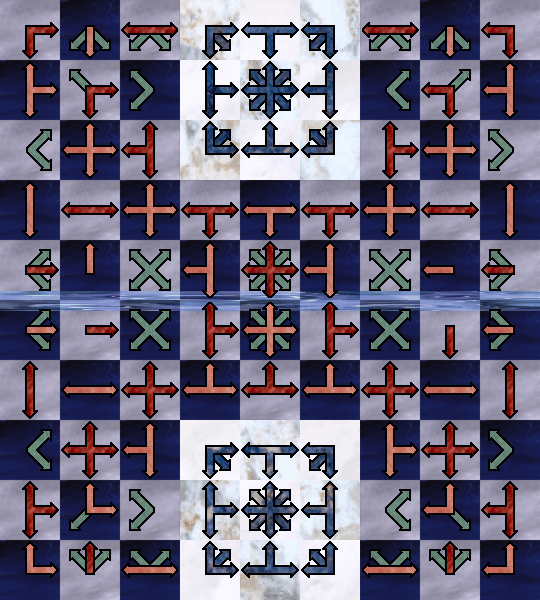 This move allows the Ninny to step two spaces in the same direction, ignoring the arrows on the square it passes over, to capture an enemy piece. The space it passes over must be empty, and it may not use this power to cross back to its own side of the river. This additional power is not a permanent promotion. When a Ninny crosses back to its own side of the river, it ceases to have this power, and it regains it whenever it crosses back to the far side. Aside from pieces, setup, and the nature of piece movement, which are all described above, the only other thing that distinguishes Storm the Ivory Tower from standard Chess is the object of the game. The object is based on what it is in Chinese Chess instead of standard Chess. The object is to either checkmate or stalemate your opponent's Brain. This is equivalent to capturing the Brain, which is the goal of Smess, except that no capture is actually made. Three-times repetition is also a loss-condition, at least as the game in implemented by Zillions. The rule should really be the same as in Chinese Chess, which is that the same piece may not check the the Brain three turns in a row. It is possible for Brain + Ninny to force stalemate on a lone Brain, but only if the Brain can command the center file. It is also possible for a Brain + Ninny to force checkmate, but only if the Ninny is already inside the Ivory Tower or on a neighboring Fuddy-Duddy square. The combinations of Brain + Clodhopper and Brain + Toady will both result in a draw against a lone Brain. Although the Toady is the weakest offensive piece, it is the most important defensive piece. It will usually be worthwhile at some point to exchange a stronger offensive piece for a Toady. Although a lone Fuddy-Duddy or a lone Yahoo is better against a lone Brain than a lone Clodhopper is, two Clodhoppers are a more powerful combination than two Yahoos, two Fuddy-Duddies, or a Yahoo plus a Fuddy-Duddy. In general, piece values may be ranked as follows: Brain > Numskull > Clodhopper > (Yahoo = Toady) > Fuddy-Duddy > Ninny. To play this game, you should print out a copy of the board. A color printout would be best. At the very least, use a graphics program to stretch the image to fit the page. If you're able to, make your own board by printing out sections onto sticker paper, then affixing them to artist canvases or to other game boards. The images on this page are reduced in size. Here are links to fullsize board images, including the one shown above and some alternate boards. The alternate boards are based on designs by Michael Howe and Larry Lynn Smith. Michael Howe's design uses small arrows, and I modified this for several boards by drawing lines between arrows. These boards all feature borderless arrows. Larry Lynn Smith's design uses fatter arrows with borders. Use Chinese Chess pieces for their equivalents in Storm the Ivory Tower. Use Chess pieces from either two sets or one set with extra Queens. Although Storm the Ivory Tower has more types of pieces than Chess has, Pawns may be used for both Toadies and Ninnies, since these pieces essentially move the same and are distinguished mainly by location. For the other pieces, I recommend Kings for Brains, Rooks for Numskulls, Knights for Yahoos, Bishops for Fuddy-Duddies, and Queens for Clodhoppers. Print out piece images and apply them to red and blue poker chips. You can either do printouts onto sticker paper, or you can glue your printouts onto the poker chips. Zillions of Games plays against itself with 30 seconds thinking time on a Pentium III Windows Me computer. The Enneagram is a system of nine personality types, and the seven pieces in this game each represent a different type, at least as I conceive them. This bit of satirical verse will provide clues on which piece is which personality type, on which personality types were not represented in this game, and on what my imaginary pretext is for not including them. The real reason, of course, is that Chinese Chess, upon which this game is based, had only seven types of pieces, which means two would have to be left out. Suffice to say, this game does not present any personality type in its best light. The world outside is too mundane. You are so right, he often lies. Do it right, the Fuddy Duddy way. I'll go my own way, cries the Yahoo. You're my buddy? What a whopper! You ain't nothing but a Clodhopper! That's why it's bliss to be a Numskull. The Ninny gives up his right to be. all heard the Prima Donna loudly complain. We'll go play whatever you choose. Storm the Ivory Tower was invented by Fergus Duniho. It was initially conceived under the name of Sycophant Smess, named for its counterpart to the Elephant in Xiáng Qí, whose name can be translated as Elephant Chess. The Sycophant moved two spaces in any direction given by the arrows on its square, and the arrows were set up to keep Sycophants on their own side of the board. This kept them near the Brain, which made Sycophant an appropriate name. But Sycophant Smess was too drawish, and one of the first changes made to fix this was to allow the Sycophants to move across the river. I also experimented with a new piece, called a Dumbo, that was based on the Korean Elephant. I didn't like this alternate piece, and I eventually used the name of Dumbo for a piece that could move one or two spaces in the same direction. Replacing the Sycophant with the Dumbo called for renaming the game, and I eventually came up with Storm the Ivory Tower. The original release came out in 2003. But it had some design flaws, and the game got redesigned in 2005. The main changes are a redesigned board and modified powers of movement for Yahoos, Ninnies, and Fuddy-Duddies (formerly called Dumbos). These changes were made to eliminate kludgy rules, to make the game less drawish, and to more closely parallel Chinese Chess. The prior version gave special moves to Ninnies and Yahoos to keep them from becoming trapped in their own Ivory Tower. To eliminate the need for this, the new board prevents a Ninny from entering an Ivory Tower with its normal one-step move, and the new powers of movement for the Yahoo allow it to freely enter and exit an Ivory Tower. The old Yahoo would get trapped, because it made two one-step moves. In other words, the arrows on its pass square affected its direction of movement. But the arrows on the pass square have no effect on the movement of the new Yahoo. This change allows it to exit the Ivory Tower. An imbalance in favor of defense had made prior versions of the game too drawish. To tip the balance the other way, I added a river, gave additional powers to a Ninny across the river, and restricted the Fuddy-Duddy's one-step move to when it is across the river. With the additional power now given to Ninnies, also allowing them to promote offended my aesthetic sensibilities, and it seemed like overkill. So I decided to eliminate the ability of a Ninny to promote, making it more analogous to a Chinese Chess Pawn. The changes made to the Yahoo and Fuddy-Duddy also made them more analogous to their Chinese Chess counterparts. Since the initial release of the second version, I have renamed Dumbos Fuddy-Duddies, and in response to public demand, I have, with some assistance from Michael Howe and Larry Lynn Smith, developed alternate boards that do not use loud Smess-like graphics. This variant bases pieces and setup on Korean Chess instead of Chinese Chess. It is like the main version with these differences. Each Brain begins on the center space of his ivory tower, and the Fuddy-Duddy and Clodhopper move differently, as described below. Fuddy-Duddy This Fuddy-Duddy is based on the Elephant from Korean Chess. It follows a three-step path that begins in one of the directions given by an arrow on the square it moves from. After the first step, it changes direction by 45 degrees, in exactly the same manner as a Yahoo changes directions on its second step, and takes two more steps in the new direction. The first two steps of its path must be empty, and the last must be empty or occupied by an enemy piece. Clodhopper This Clodhopper is based on the Cannon in Korean Chess. Like the Numskull, it rides any number of spaces in a straight line, moving in any of the directions that the arrows on its starting space point. But it must hop over another piece to move anywhere. No Clodhopper may hop over another Clodhopper, and a Clodhopper may be used to block a Clodhopper attack. This is a great extension of the Smess idea! It's almost similar to variant i just described. I once did a Shogi adaptation of Smess, called Smegi, which added Shogi dropping rules to Smess. But a Smess adaptation of Shogi is more of a challenge. It cannot work as straightforwardly as a Smess adaptation of Chinese Chess, because the pieces are not so easily distinguished by types of movement. Instead, they are distinguished mainly by directions and ranges of movement. So what I would suggest is this. Add the rule that certain pieces may only move in forward directions, either vertically forward or diagonally forward. For this rule to work effectively, every space would need to have both forward and backward arrows on it, for one player's backward is the other player's forward. This would leave the forward moving pieces available directions to move in. As in Shogi, the Knight should be able to leap. This is important, because it is easy to build barricades in Shogi, and it sometimes takes the leaping ability of the Knight to get through them. With a vertical forward arrow, I would allow the Knight to leap as it does in Shogi. With a diagonal forward arrow, I would allow it to leap to either of the two spaces it could reach by moving once diagonally, then once orthogonally outward. 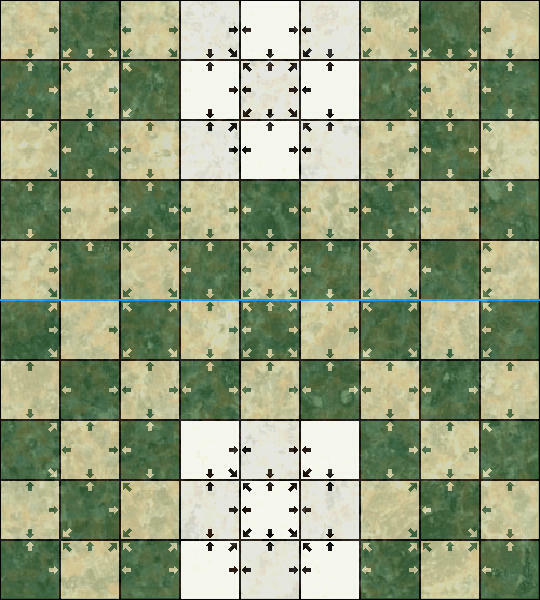 Here is my smess adaptation of Shogi (it's not complete, i did not chosen directions of arrows yet, and even if someone will help me to complete it, it don't seems ideal). King, of course, replaced with brain. Flying chariot and angle mover both replaced with numskulls. All 4 generals (gold and silver) replaced with ninnies. Pawns are replaced with pieces, wich can move only 1 step forward and sideways. Lances replaced with pieces, wich can move any number of steps forward and sideways. Knights are pieces, wich moves as yahoos, but only forward and may leap. Numskulls dont's promotes, other pieces promotes to ninnies (according to Shogi rules). No prohibition of dropping pawn on file, wich already have one pawn, other rules like in Shogi. Another idea (also don't seem ideal) is that arrows changes defination of 'forward'. I've thought of a change to the Ninny's movement which I think could improve this game. Instead of having a two-space capturing move when across the river, it would gain a two-space non-capturing move. This would better complement the Fuddy-Duddy, which gains a one-space non-capturing move across the river. Also, by not having any special powers of attack across the river, pieces would not be threatened by Ninnies two spaces away, which would make the game less confusing. These two advantages are mainly aesthetic. The main tactical advantage is that the Ninny would gain greater mobility, increasing its ability to storm the enemy ivory tower. This should do more to keep the game from being drawish than giving the Ninny a two-space capturing move across the river. I have made a preset for the new version at /play/pbm/play.php?game%3DStorm+the+Ivory+Tower%26settings%3Dversion3 I have also corrected a bug in Game Courier that prevented the presets for Storm the Ivory Tower from working. If you like Smess but would like a more interesting combination of pieces, you may well like Storm the Ivory Tower.